Leading American composer Kenneth Fuchs celebrates his unique 15-year recording history with conductor JoAnn Falletta and the London Symphony Orchestra with three stunning new concerti and an orchestral song cycle. The Piano Concerto sees the hallmarks of Fuchs’s music continuing to find its striking visual counterpart in the paintings of Helen Frankenthaler, while the Poems of Life set the words of Judith G. Wolf in transformative narratives of love, loss and enlightenment. Glacier for electric guitar and orchestra is a virtuoso concerto inspired by the sweeping vistas of Montana, and the jazz-inflected Rush for saxophone and orchestra is a bravura tapestry of cadenzas and variations. Kenneth Fuchs has composed music for orchestra, band, voice, chorus, and various chamber ensembles. The London Symphony Orchestra, under the baton of JoAnn Falletta, has recorded five albums of Fuchs’s music for Naxos American Classics. The first (8.559224), released in August 2005, was nominated for two GRAMMY® Awards. The second (8.559335), featuring music for horn, was released in January 2008. Musicweb International stated, “Fuchs’s distinctive voice is evident from the outset, and his flair for orchestral colours and sheer lyricism shine through.” The third (8.559723) was released in August 2012. BBC Music Magazine stated, “Kenneth Fuchs writes tonal orchestral music of great imagination. He’s a master of orchestral writing. On Naxos’s third Fuchs recording, everything gets five-star treatment. The LSO under JoAnn Falletta sounds brilliant in a spacious Abbey Road recording.” The album was nominated for a GRAMMY® Award. The fourth (8.559753), recorded at Abbey Road Studios in August 2013, featuring baritone Roderick Williams in a program of vocal music based on texts by Don DeLillo, John Updike, and William Blake, was released in August 2014. Gramophone magazine wrote, “Fuchs claims his own expressive warmth and colour … The performances are exemplary, from baritone Roderick Williams’s commanding artistry to the bold, fresh playing of the London Symphony Orchestra under JoAnn Falletta’s sensitive direction.” The principal work, Falling Man (text by Don DeLillo, adapted by J. D. McClatchy), was presented as a monodrama by the National September 11 Memorial & Museum in New York City in commemoration of the 15th anniversary of 9/11. The fifth album (8.559824), featuring concerti for piano, electric guitar, and alto saxophone, as well as an orchestral song cycle for countertenor, represents the continuation of more than 30 years of musical collaboration between Fuchs and Falletta. Naxos released an album of Fuchs’s chamber music (8.559733) in April 2013, which includes Falling Canons, Falling Trio, and String Quartet No. 5 “American”. Gramophone stated, “Few composers have gained as much mileage – or found greater range – than Fuchs’s ‘Falling’ works, which open and close this collection.” Albany Records released the highly successful album Kenneth Fuchs: String Quartets 2, 3, 4 performed by the American String Quartet. The American Record Guide stated quite simply, “String quartet recordings don’t get much better than this.” Fuchs’s music is performed worldwide and has achieved significant global media exposure through audio broadcast, downloading, and streaming. Fuchs serves as professor of composition at the University of Connecticut. He received his doctor of musical arts degree in composition from The Juilliard School, where his teachers included Milton Babbitt, David Diamond, and Vincent Persichetti. 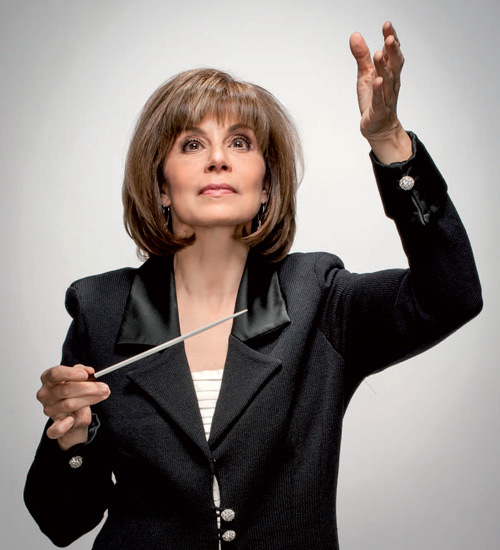 JoAnn Falletta serves as music director of the Buffalo Philharmonic and Virginia Symphony, and is the principal guest conductor of the Brevard Music Center of North Carolina. She has guest conducted over a hundred orchestras in North America, and many of the most prominent orchestras in Europe, Asia, South America and Africa. She served as principal conductor of the Ulster Orchestra from 2011 to 2014, with whom she made her debut at the BBC Proms in London and recorded works by Gustav Holst, E.J. Moeran and John Knowles Paine. Recipient of the Seaver/National Endowment for the Arts Conductors Award, winner of the Stokowski Competition, and the Toscanini, Ditson and Bruno Walter conducting awards, Falletta became the first female conductor to lead a major American ensemble upon her appointment as music director of the Buffalo Philharmonic Orchestra in 1999. She has received twelve ASCAP awards, served on the US National Council on the Arts and is a member of the American Academy of Arts and Sciences. As a champion of American music, she has presented over five hundred works by American composers including well over 100 world premieres. Her Naxos recordings include the double GRAMMY® Awardwinning disc of works by John Corigliano and GRAMMY® nominated discs of works by Tyberg, Dohnányi, Fuchs, Schubert, Respighi, Gershwin, Corigliano, Richard Strauss, Hailstork and Holst. Established in 1904 by a number of London’s finest musicians, the London Symphony Orchestra (LSO) is a selfgoverning musical collective built on artistic ownership and partnership. The LSO is resident orchestra at the Barbican in the City of London, where it gives 70 symphonic concerts every year, and performs a further 70 concerts worldwide on tour. The orchestra works with a family of artists that includes the world’s greatest conductors – Sir Simon Rattle as music director, Gianandrea Noseda and François-Xavier Roth as principal guest conductors, Michael Tilson Thomas as conductor laureate and André Previn as conductor emeritus. LSO Discovery, the orchestra’s community and education program based at LSO St Luke’s, brings the work of the LSO to all parts of society and engages with 60,000 people every year. The LSO reaches out much further with its own recording label, LSO Live, which launched in 1999 as the first of its kind and now streams its music to millions around the world. "The song-cycle Poems of Life (2017) is the heart of this well-played, sumptuously scored programme. It is a beautifully conceived cycle, the music tender and rich, the solo cellist and cor anglais (the wonderful Tim Hugh and Christine Pendrill) amplifying respectively the persona of the countertenor in the songs and his lost beloved. Aryeh Nussbaum Cohen sang the premiere in Virginia and has the work fully under his skin; the accompaniment by the LSO is first-rate.